The creations of God are just mind-blowing. 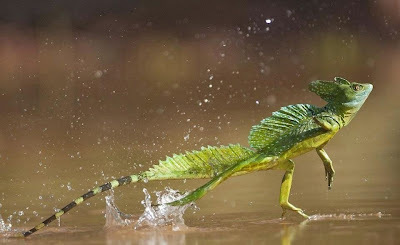 This lizard is called Jesus H. Christ because it walks on water. We all know that our Lord Jesus was once walked on water during His stay on earth. So this lizard was named after our Lord Jesus because of its ability to walk on water. I am just speechless. Everytime we discover something new about the creations of God we tend to wonder, how many more things are we yet to discover? The answer is, a million and one things. Like I usually say, our knowledge of God and His creations are just like a grain of rice in a big bag of rice. Below are more pictures of Jesus H. Christ Lizard. I hope you get inspired to love and appreciate the beauty in God's creations. ENJOY! To get inspired by more posts on discoveries, please do search this blog on this blog's search engine with the hashtag discoveries e.g #Discoveries I hope you love and get inspired by what you find. Yes, have heard of it before.